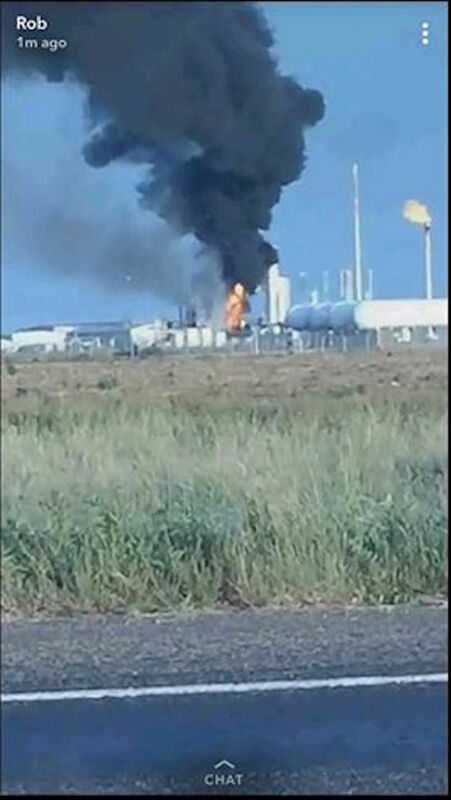 Fire rages at the Energy Transfer plant off Texas Beef Road in Sunray, TX, in this photo taken by a resident. After a fire that broke out at the Energy Transfer plant off Texas Beef Road in Sunray, TX, late Saturday night, city officials said they still do not know how the fire started or where exactly in the plant it occurred. The fire, they said, had to do with the gas they refine. “Some type of gas that they refine in the plant, but I’m not 100 percent sure on the type or where the fire was in the plant. I can tell you everyone that was at the facility has been accounted for, there is no injuries,” said Tommy Brooks, Moore County emergency management coordinator. Emergency crews stayed on scene overnight to monitor the situation, they were sent home Sunday afternoon. No injuries were reported and the City of Sunray was not in any danger, although a perimeter was set up a mile around the plant. Tommy Brooks with the Moore County Office of Emergency Management explained to us Saturday night what kind of precautions were taken. “They’ve locked in all the pipes, pipelines going into the facility, once all that gas burns off, which will be several hours from now, they’ll go in and start doing air monitoring and assessments and well determine when we can open the area back up,” Brooks said. Energy Transfer crews were allowed on the scene this afternoon to assess the damage and start the clean-up process.